"This book illustrates what we firmly believe at UBS, namely that leadership development is a key means for driving and aligning corporate strategy and culture, thus going far beyond the traditional concept of management education and training. Positioned this way, it is a powerful and not easily replicated competitive advantage." "In this day and age, nothing is more important than strategic executive development. Jim Bolt has done a great job in creating a book that is rich in texture with practical, realistic case histories." "Jim Bolt continues to support practitioners in designing and developing executive development strategies that accelerate business success. He provides practical advice for addressing business challenges and executive development methods for creating the organizational capability and alignment needed for business success. I have personally been guided by the five high impact uses of executive development." Susan Burnett, senior vice president, People and Organization Effectiveness, Gap Inc.
"Brimming with sage guidance and detailed case studies, Strategic Executive Development contains the cumulative wisdom of three master practitioners of executive development." "A great step–by–step guide for creating executive development programs. Real world cases and a good overview of how executive development can be used to impact the organization." 1. Critical Trends in Executive Development: What Lies Ahead? 2. Creating Executive Development Strategies and Programs That Support Your Business Objectives. 3. 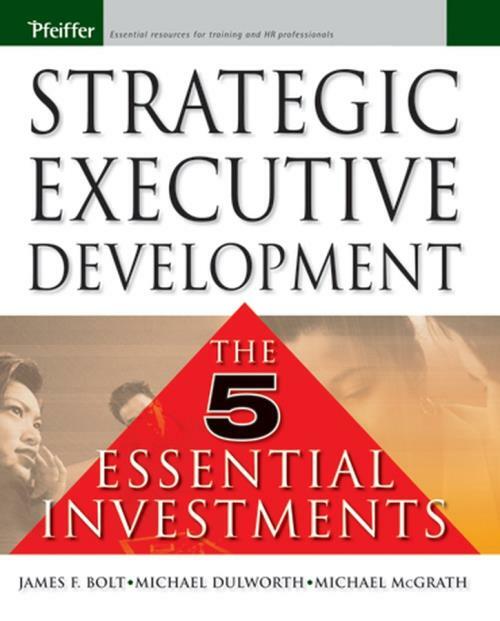 The Five High–Impact Uses of Executive Development. 4. Creating Strategic Unity and Alignment. 5. Ensuring the Successful Transition of New Executives. 6. Accelerating the Development of Emerging Leaders. 8. Identifying and Addressing Critical Business Challenges. 9. The Business Impact of Corporate Executive Development. Appendix A: EDA 2004 Trends Survey Advisory Board. Appendix B: EDA 2004 Trends Survey Respondent Demographics. Appendix C: Definitions of Twelve Best Practices from the EDA 2004 Trends Survey. Appendix D: Comparing 2000 and 2004 Trends Survey Results. Appendix E: Research and Analysis: Examples of Documents to Gather and Review. Appendix F: Design: Typical Action–Oriented Learning Activities. Appendix G: Pilot Program: Typical Facilitator Activities. Appendix H: EDA s Rapid–Cycle Design® Process. Appendix I: Web–Based Survey: Typical Question Themes. Appendix J: Different Ways of Measuring Executive Development.